Tung Kin Foong's Blog: Bronze statue of Robert Sandilands Frowd Walker. Bronze statue of Robert Sandilands Frowd Walker. I had been driving passed this statue of one of our past colonial master for more times than I can count through the years and finally curiosity got the better of me. 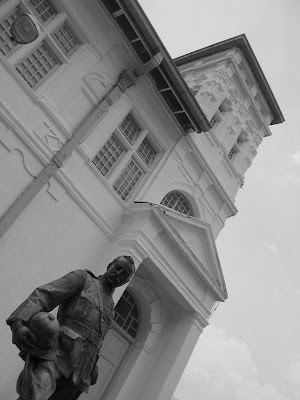 Immortalised in bronze, His Excellency RSF Walker stands proud in the court yard of the Perak Museum today. Such work of art would certainly require a capable sculptor and the name of the sculptor was found on the bottom right hand side of the statue. A well known sculptor of the era, Charles Leonard Hartwell was born at Blackheath in 1893 and studied sculpture at Lambeth under W.S. Frith and then at the Royal Academy School, he was made Royal Academician in 1924 and died in 1951. 1. Bronze bust of Lord Oxford and Asquith for the City of London School. 3. Bronze bust of Sir Quickstone Browne at the Royal College of Surgeons. 4. Stone Tablet of Sir Henry Wilson, summounted by a bronze wreath. Taiping Airport a.k.a Tekah Aerodrome.